US-backed fighters in Syria have reported the final liberation of Raqqa from Islamic State (IS, formerly ISIS/ISIL). However, there seems to be no further plan in Washington of how to bring life back to the almost completely destroyed city. Opposition forces in Syria, including Kurdish Syrian Democratic Forces (SDF) and the People's Protection Units (YPG) announced a ground victory over the terrorist group in its former self-proclaimed capital in Syria. The American-backed SDF claimed on Tuesday that Raqqa is under their control. While "major military operations" in the city are finished, the militia fighters "are now clearing the city of sleeper cells, if they exist, and mines," SDF spokesperson Talal Salo said in a statement. "We are now in Raqqa city... Raqqa is liberated from ISIS mercenaries, some foreign members of them remained," a local militia fighter told RT's Ruptly agency. "Raqqa is going to be entirely liberated within a few hours," he added. A spokesperson for the US-led anti-terrorist operation in the region, Ryan Dillon, of the Combined Joint Task Force, said the US military officials were "aware of the reports that ISIS has been defeated in Raqqa." The city has been 90 percent cleared of IS, the US military officials suggest, saying that they still expect some resistance. "Clearance operations continue and we expect our SDF partners to hit pockets of resistance as final parts of the city [are] cleared," Dillon said. Videos filmed on the ground by Ruptly video news agency show a city that has been turned to a deserted wasteland of burned-out cars and twisted metal. 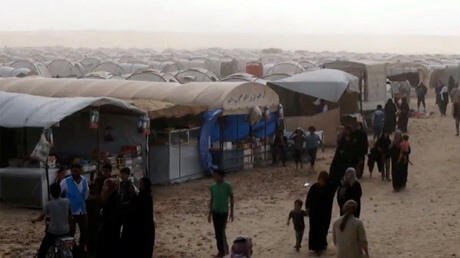 Once inhabited by 300,000 people, less than 1 percent of the population remain in the city, which has no working electricity or running water. Raqqa is still laced with booby traps and explosives laid down by retreating IS terrorists. In addition to that, some 3,000 bombs have been reportedly dropped on the former IS stronghold by the US-led coalition since January. 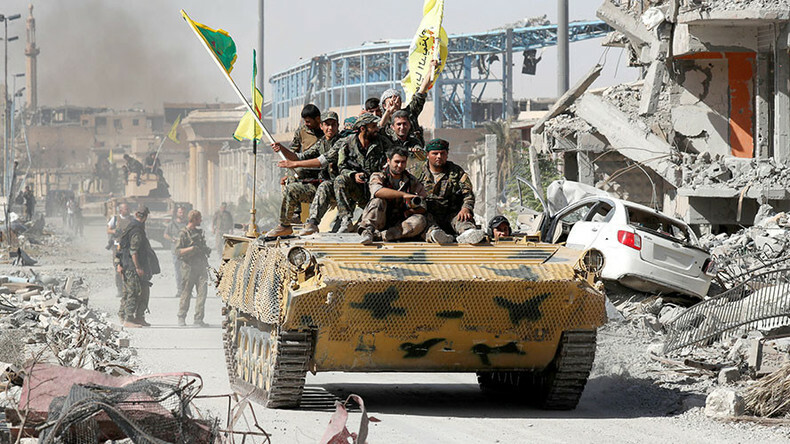 While recapturing Raqqa, which became Islamic State's de-facto capital back in 2014, delivers a blow to the terrorist group, the reported victory seems to have come at a high price. During the months-long military operation, with the US-led coalition supporting local fighters from the air, the UN estimated dozens of people had been killed in Raqqa every day. "Civilian casualties are large and there seems to be no real escape for the civilians," UN officials have said, admitting the cost of the "constant air raids" from the coalition forces. Saying that "the war against ISIL as we know it is more or less over," Beirut-based journalist Martin Jay told RT that there still are "huge questions to deal with in the coming months and years." "Raqqa needs to be rebuilt, [thousands of] people need to be put back in their homes, there is a massive reconstruction job ahead and nobody in the international circle, not the EU nor the Americans is waving a checkbook or even suggesting they are going to pay for it," Jay said. Meanwhile, according to reports in the US media, Donald Trump's administration is still struggling to shape "broader strategy for the war-torn country." Citing three US officials involved in Syria policy discussions, an NBC report claimed there is still no plan of what to do next in Syria, with an apparent split among US high-ranking foreign policy officials. The US Ambassador to the UN, Nikki Haley, is among those who "favor a plan that leads to ousting" Syrian President Bashar Assad, the report reveals, adding that "moderate factions of the government feel he [Assad] is the only thing keeping the country from turning into a black hole engulfing much of the region."